What made you decide to start writing? I actually went to a book signing to see Colleen Hoover with a friend. It was the first signing I ever attended and was completely nervous. My friend mentioned that she was writing a book. It was always something I had thought of doing but hearing that she was gave me the courage to start one. 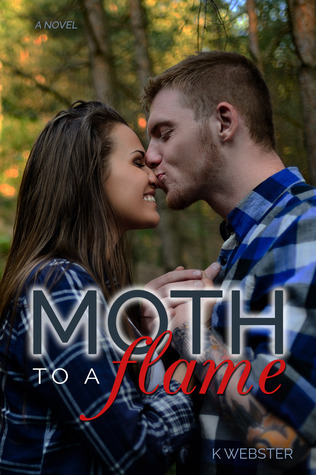 Ten days later, I’d written Moth to a Flame. Was this something you always thought you’d do? Yes, ever since I was a child, I figured I would write. At the time, I imagined writing more of a memoir of my life since it was littered with traumatic events. However, I soon realized people prefer the world of fantasy…as do I. How do you come up with your characters or story ideas? Sometimes it is simple. For instance, with Alpha & Omega that releases February 16th, I came up with the title first. The big craze is alpha males so I thought it would be funny for the character to be named Alpha…he goes by Al for short. Alpha seemed like a name a Greek god or angel would have and thus my character was born: a hunky, badass, alpha angel. The story fell into place at that point. Most of my stories play out as movies in my head and I simply record them. I even had a story idea while watching the Bubble Guppies cartoon. They were stuck in an avalanche. I thought, what if I had a couple of characters who also got stuck in an avalanche. However, instead of it being fun, it would be awful: Surviving against the elements, trying not to kill each other, oh and did I mention they are going through a divorce? That story is one of a second chance romance. How do you get inspired to write? I usually read or watch a movie to get inspired. I barely make it twenty minutes in before I’m twitching to get back to my stories. What do you do while having writers block? Unfortunately, I have writer’s diarrhea…meaning the stories JUST WON’T STOP! LOL! I have had blocks on my stories though and I tend to work them out in the shower. The shower is the only place I can free my head from distractions and think it out. Oftentimes, I will talk it out with the hubby and he’ll help me get past a road block. What kind of stories do you write? I actually write all sorts. However, they all have a romantic theme. I have a paranormal romance, Apartment 2B, that’s already out and carries the most five star reviews. I also have two different series that follow different couples. One is a rock star series that people seem to love. I’ve written suspense stories. Cop drama. An angels/demons story releases next week. And, I just finished a STEAMY historical novel. Also, up my sleeve, I’m writing a horror novel under a pen name. I even have a sci-fi story in my head lol. I started writing in November of 2014. Since then, I have published 11 novels…the 12th comes out next week. I’ve completed fourteen total and keep on plugging away. I just finished book one in my Becoming Her Series which is historical romance set in the late 1800s in London. Becoming Lady Thomas is about a woman that is set to marry her childhood sweetheart. But, when her father informs the family of his mountains of debt, she soon learns that he negotiated for Lord Thomas to take the hand of one of the daughters of his choosing in marriage. Elisabeth is devastated when he chooses her and that’s where it becomes complicated. He whisks her away to the city and she soon realizes that unplanned love is oftentimes what is meant to be versus the kind of love we think we want. IT IS THE STEAMIEST STORY I HAVE WRITTEN…so don’t let the time frame deter you. I’m hoping to put this one out for free! What? There is such a thing? Just kidding. I am quite obsessed with graphic design and you’ll see me making teasers and covers in Photoshop when not writing. My husband and I also love going to concerts…big rockers! Mostly, my husband, kids, and I just sit at home and chill. We’re kind of boring lol. All the action takes place in the books! K. Webster loves my husband of 11 years and sweet kids. Her passions include reading, writing, graphic design, and shopping! She absolutely loves social media and the power of how it connects people all over the world. You can usually find her easily on Facebook, Twitter, Instagram, Pinterest, and Goodreads! The views, opinions, and beliefs expressed by guests are their own and do not necessarily reflect thos of Girl Who Reads. Girl Who Reads is an Amazon advertising affiliate; a small commission is earned when purchases are made at Amazon using any Amazon links on this site. Thank you for supporting Girl Who Reads.